The Dutch embassy and consulate in Turkey have been closed off for security reasons, Reuters reported citing Turkish foreign ministry. 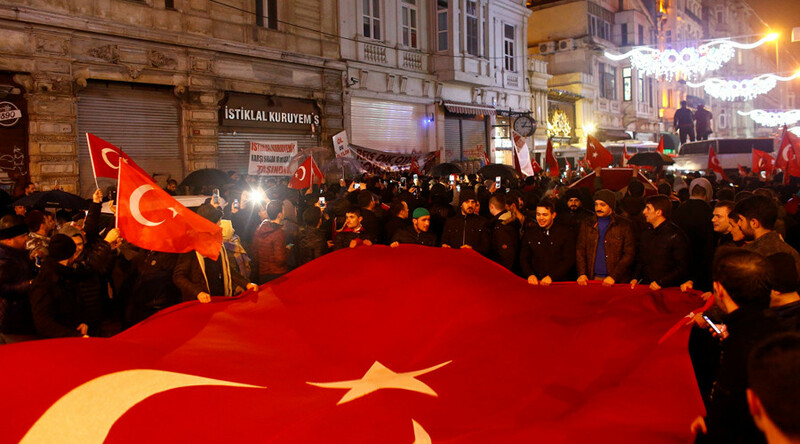 A mass rally took place outside the consulate in Istanbul after Turkish Foreign Minister was refused landing in the Netherlands. The residences of the Dutch ambassador, charge d'affaires and consul general were also closed off, according to the same source. “It has been explained to our counterparts that this grave decision taken against Turkey and the Dutch Turkish community will cause serious problems diplomatically, politically, economically and in other areas," the statement said, as cited by Reuters. The move follows the Dutch government barring Turkish Foreign Minister Mevlut Cavusoglu from flying to Rotterdam. Initially, Cavusoglu was to speak at a rally organized by Ankara to promote the referendum on amending the Turkish constitution among Turks living in the Netherlands. Just hours before the shutdown of Dutch diplomatic buildings, another top Turkish official, Family Affairs Minister Fatma Betul Sayan Kaya was blocked from entering a Turkish consulate in Rotterdam by Dutch police. The move has triggered mass protests of Turkish community members outside the building. Tensions between Ankara and Amsterdam have been building up for some time, before reaching a breaking point on Saturday night. The Dutch authorities said that it would ask “for an explanation” from Ankara, following the incident.